So, I'm at the local Walmart not long ago and this lady walks in front of me with the strangest display of artwork I've ever seen -- painted onto the back of her head! I kid you not. 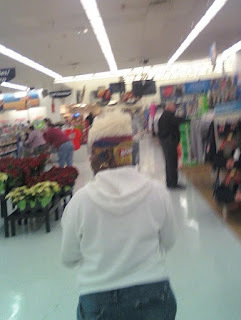 On the back of this woman's head was a perfect graphic representation of a bag of skittles. I nearly broke out laughing at the sight, and thought, what kind of fool goes through the expense of creating this advertisement on her head ... or was she just smarter than the rest of us and somehow managed to secure sponsorship by the product? Did she rent the space on the back of her head to the Skittles corporation? Then I thought, the only thing more foolish than painting an advertisement on the back of one's head is being that other fool chasing the person around Walmart trying to get a picture. The things one sees at WalMart! Oh snap! you have to send it in to this site! You are not the only one with sighting from Wal-mart... and why do you think they invented camera phones???? I get my picture taken all the time, and don't know it...but I haven't graced this site, yet! Only at Walmart. That is crazy! But P.S. Don't include Walmart in your MS! I think you'll get sued and worse.